Me:	Hi, my name is Chris Webster. 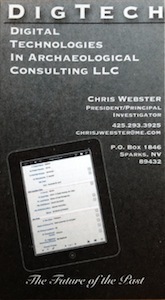 I’m the owner of a consulting business that’s just like all the other’s that you deal with. Give me work. Client:	No. We deal with enough archaeologists, thank you very much. Me:	Hi, my name is Chris Webster. I’m the owner of a radically different archaeological consulting firm here in town. Can I show you how the future of archaeology is going to look? Client: Sure. How are you doing things differently? Client: Sounds good! When can you start? OK. So the conversations aren’t going exactly that way, but, I talked to a few big-name clients today and they were very excited about the possibility of paying less for the same quality of work. They were also very intrigued by my approach and by what I had to say. I’m so excited right now! When I get my first signed contract I’m buying everyone who reads this blog a beer! Just come to Reno and I’ll make it happen :) . Archaeologists aren’t big drinkers, right? In the first post of this series I covered the order of steps to starting a business, permits, the type of business you should operate, business licenses, and the employer identification number. If you haven’t read that post yet, go ahead and do so before you read this one. Just be sure to leave comments about how I screwed it all up and should have done things differently. I don’t want anyone else making the mistakes I’ve made. As of the last post I had already received my state business license. To operate I also needed to get the licenses for where the business is physically located. Here in Sparks, Nevada that means getting a license from the City of Sparks and Washoe County. Since Sparks and Reno are adjacent each other Sparks had a deal where you could just check off the Reno box and cover that too. It just made sense to do it that way so I did. A quick check of the City of Sparks website told me that I needed several pieces of paper before I could go there and apply. They wanted my State Business License, my LLC Charter, my State of Nevada Sales Tax Use Permit (which came with my state business license) an application for the city business license, and a Home Occupation Permit. Now, part of the reason I opened a post office box was to avoid using my home address for the business. I can do this work from anywhere. All I need is a computer, a phone, and a good internet connection. However, I’ve found out that most of the things I’ve done so far require a physical address for the business and the City of Sparks is not different. The crappy thing was the Home Occupation Permit cost an additional $100 and the owner of the house needed to sign it. And, there’s the rub. It specifically says in my lease that we will not run a business out of the house. That’s the reason I’ve been trying to avoid using the house’s address. Well, I couldn’t avoid it any longer. I decided to come clean and sent my landlords (who live in Chicago and whom I’ve never met) a detailed reason why I needed them to sign the attached form. I was open and honest and told them that I have liability insurance and that I’m not even really working out of the house, which is true. I’m usually at a coffee shop. We’ve been good tenants for over two and a half years now and they signed it with no questions. That was a relief. I wasn’t sure what I was going to do if they didn’t sign it. So, I went to the City of Sparks offices and, $430 later, I had applied for my Sparks/Reno/Washoe County business licenses. Unfortunately, they won’t be delivered for a few more weeks. They said it takes three to four weeks total. If I get work in another county, which is likely, I’ll have to apply for a business license there too. Fortunately, since I don’t live in the other counties and would just be working there, the turnaround for business licenses is usually only about a day. I can wait until I’m awarded a contract before I get the licenses. Of course, if I submit a proposal for an area I’m not licensed to work in I’ll immediately call them to find out what the procedures are just in case I am awarded the contract. I’ll let you know whether that plan works out or not. What I thought was going to be one of the more simple tasks turned out to cost me an extra $45 and could have lost me my business and my personal property. Let me explain. First, check out the Instagram photo stream in the right hand column of this page. The business card should float by at some point. I designed the card, after much trial and error, on my iPad using the iDraw App. It’s a great vector drawing app and can do amazing things considering how cheap it was. For the first round of business cards I decided to go with Vista Print. They will actually print your first set for free if you don’t want any extras. I wanted extras. The color scheme I was going for looked better on a thicker paper with a matte finish. Also, the free ones have “Vista Print” printed on the back side. So, the first $250 cards cost me about $23 which included shipping and a shinny card holder. At a lunch with my future accountant, and fellow Civil Air Patrol member and friend, I whipped out my snappy new business card for him to fawn over. He liked it, but, like a good friend, gave me some advice. Under my name I had typed, “Owner/Principal Investigator”. In the initial list of members that I filed with my LLC paperwork I had to list myself as President. I thought that sounded a little too fancy and just put “owner” on the business card. Well, I shouldn’t have done that. Apparently, by putting owner, I opened myself up to potential liability. You see, an LLC doesn’t have owners. It has managers or members. The LLC is it’s own entity which is how your personal property is safe if you get sued for everything. They can take your business but not your house. So, by putting owner, I effectively nullified the LLC and put all the liability on me. Or, at least, that’s what my accountant said was a possibility. So, I had to change it. The second order of cards was not discounted and ended up costing my about $44. Crap. Lessons learned. This post is way too long already so I’ll have to continue the series later. Thanks for reading and I’ll see you in the field, or, at the 2013 SAAs in Hawaii! Newer Post#148 The Final Permit Is In!! Older Post#146: Big Changes on the Horizon for the Podcast!